An ex-Valve employee is releasing a new prison escape mod for the original Half-Life called Half-Life: C.A.G.E.D. 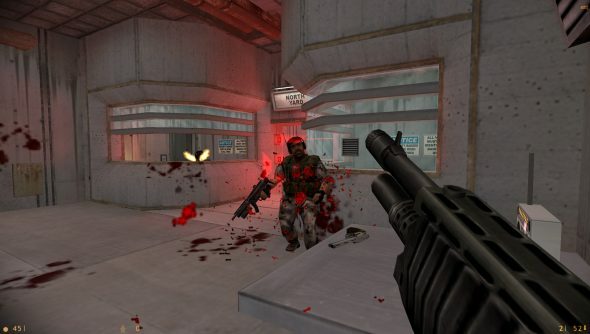 The Half-Life games are on our list of the best shooters on PC. Is it Valve sanctioned? No idea. But it’s not been pulled from Steam yet, so it looks like they’re cool with it… maybe? Half-Life: C.A.G.E.D. is heading to Steam on September 21, 2017. Naturally, you’ll need the Half-Life base game to run it. Last week we reported how Valve alumni Marc Laidlaw – a former Valve writer who worked on the Half-Life series before becoming the lead writer for Dota 2 – has written a “fanfic” (his words, not mine) blog that gives us an insight into what Episode 3 might have been. Consequently, Dota 2 was review-bombed by angry Half-Life fans who believe Valve’s continued support of their MOBA comes at the expense of a third instalment of the beloved first-person shooter series. And if you’re still on the lookout for more Half-Life stuff, check out Half-Life 2: Aftermath, which hopes to piece together everything known so far about Episode 3. For everything we know about Half-Life 3, we have a dedicated article.